The Numbers preceding the access points below refer to numbered points on the map above. Click the map above twice to enlarge it. For those seeking connections from Philadelphia, use GoPhillyGo.org. The NJ Transit Light Rail station ((6) provides easy access. ‘Get Directions’ below will link to a map showing the access point, or its closest intersection. When viewing this map, click ‘Directions’ to get directions from your location. From the closest intersection follow directions included for each location below. Addresses or GPS coordinates are provided below for each access point. 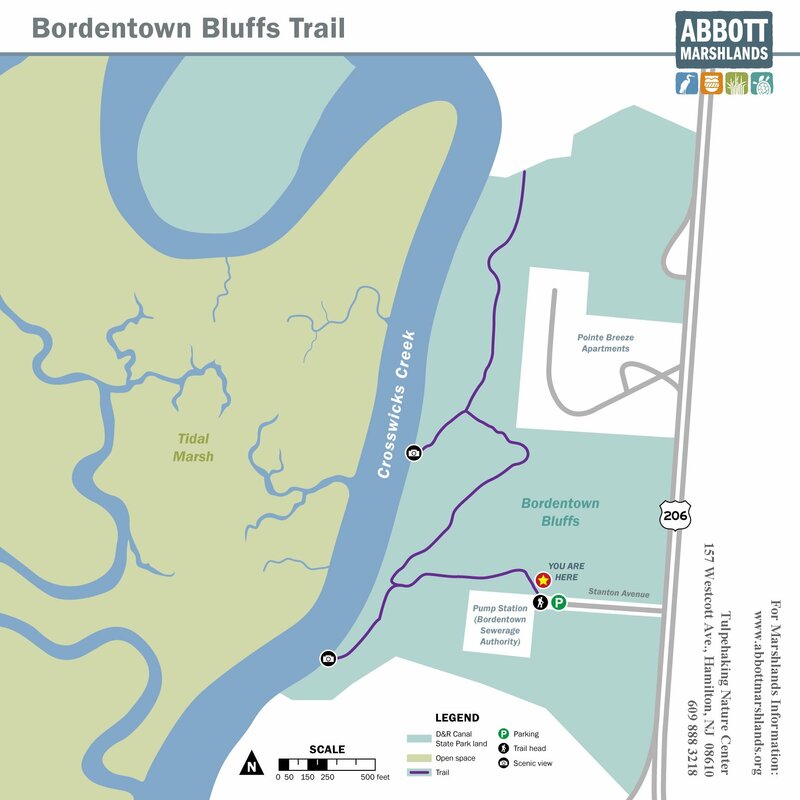 Trail maps can be downloaded either at 8″x8″ or full size. 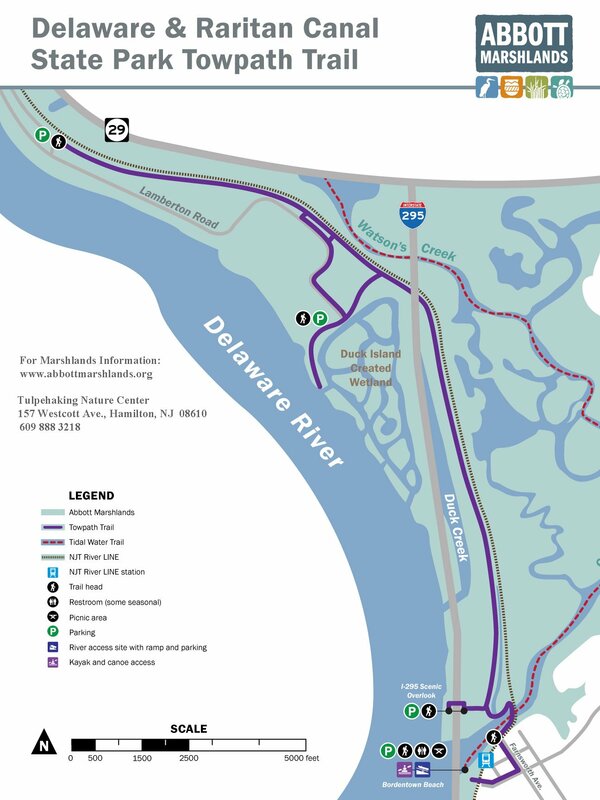 NJ Trails links are also given for trail maps; NJ Trails also provides additional trail information. Apps: To take our free upland and water trail tours, download the TravelStorys app from the AppStore or GooglePlay, For more information. Please note that bicycling is allowed only on the trail around Spring Lake and on the D&R Canal Tow Path Trail on Duck Island. Other trails are too fragile. Motorized vehicles are not permitted. For 8″x8″ map, for full size map. Biking only around Spring Lake and to/from Watson Woods, Tulpehaking Nature Center. Additional Directions: From South Broad Street turn West onto Sewell Ave. The closest intersection to the park is Sewell and McClellan. Continue past McClellan to the end of Sewell, turn left and drive down the hill to the parking lot. Parking is near the Watson House. From this location, there is access to both Spring Lake (1) and Watson Woods (2) trails. What to do: see calendar for programs. There are displays and exhibits on view. Hours: Friday, Saturday 10 am – 4 pm; Sunday noon- 4 pm. For Hiking, walk or drive down hill to Watson Wood and Spring Lake trails. Additional Directions: From South Broad St. turn west onto West Park Ave. The closest intersection to the park is West Park Avenue and Westcott Avenue. Turn left onto Westcott Avenue and then right at the sign into Roebling Park. Parking for the nature center is the lot near the Watson house, on the right just before the road descends downhill. Across the road from the parking area, there is a metal bench near a path leading to the nature center, which has a new yellow addition. Biking only to/from Watson Woods, Tulpehaking Nature Center and around Spring Lake. For Tidal Water Trail, 8″ x 8″ map, for full size map. Additional Directions: From South Broad Street, turn west onto West Park Avenue. The closest intersection to the park is West Park Avenue and Westcott Avenue. Turn left onto Westcott Avenue, and then right at the sign, into Roebling Park. Drive past the Watson House, proceed to bottom of hill and continue to parking, hiking trails, picnic tables, and Watson Creek boat launch area. Additional Directions: Northern Community Park is located on Groveville Road between Route 206 and Route 130. Groveville Road is accessible from northbound Route 206, and Route 130 in Bordentown Township. These are the closest major intersections. Additional Directions: This access point is accessible from Route 206 South in Bordentown Township, south of the I-195 interchange. From Route 206 South, turn right onto Stanton Avenue, which is the first right past Pointe Breeze Apartments. The Stanton Avenue street sign may be missing. Please do not park in front of either gate. What to do: Picnicking, Paddling. For Hiking, take bridge over Crosswicks Creek to the Tow Path Trail; see map: 8″x8″ map, for full size map. For paddling and access to the Tidal Water Trail: for 8″ x 8″ map, for full size map. Additional Directions: From Route 206, take Park St. west into Bordentown. Park Street eventually becomes West Park Street; the closest intersection is Prince Street and West Park Street. From there continue down hill to the banks of Delaware River and Crosswicks Creek. The beach is also accessible by Light Rail; . 6a. NJ Transit Light Rail Station. Use the Bordentown City stop. From here you can visit the Bordentown Beach and walk to the D&R Canal Towpath Trail. For 8″x8″ map, for full size map click here. What to do: Hiking, Bicycling. Fishing is permitted on the bridge over Crosswicks Creek. GPS Coordinates: N40 09.257 W74 43.049. Additional Directions: Trails are accessible from the Scenic Overlook on the Northbound Side of I-295, north of Bordentown. From southbound I-295, park at the Scenic Overlook and cross the pedestrian bridge over the highway to the northbound parking lot. From the parking lot, take the stairs (south end of lot) or ramp leading down to the trail. Follow the trail; after a short distance it will bear to the left, eventually reaching an intersection with the tow path. Turn north (left); the trail goes north 3 miles along the D&R Canal to Canal Boulevard* near Lamberton Road. The canal here is tidal. If you turn south (right), you will shortly reach a restored bridge over Lock 1 of the D&R Canal. 7B. Three Branch Trails can take you to the Delaware River. 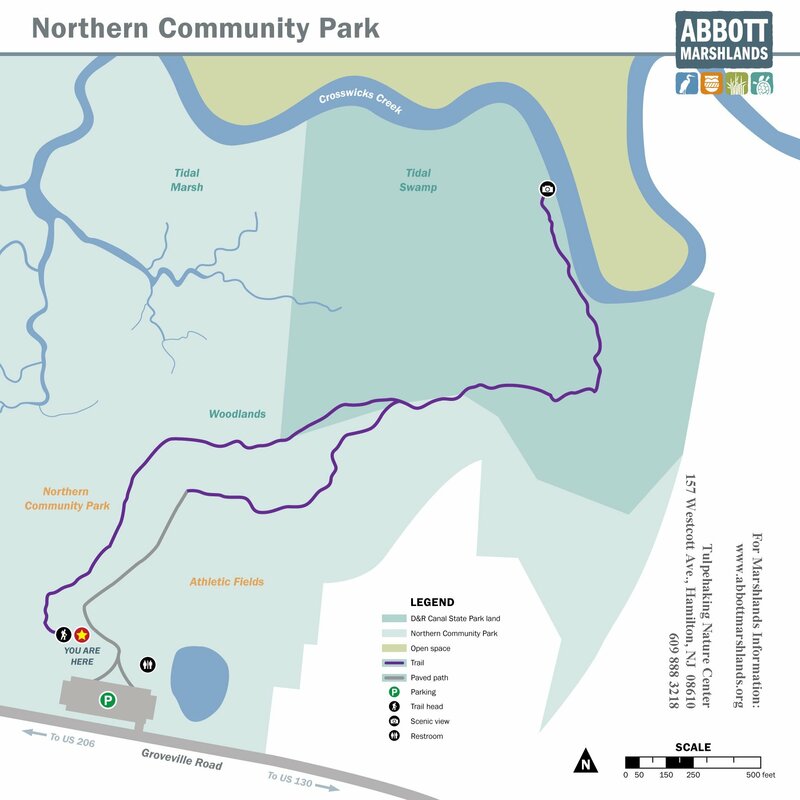 See Towpath Trail map. ‘Connector’ Trail is the southernmost one and takes you directly to parking at the south end of Lamberton Rd. Additional Directions: This location is accessible from Route 129 South or Route 29. From NJ 129 south take the Lamberton Road exit; you will first be on Canal Boulevard. Follow Canal Boulevard past Sturgeon Pond; after the road curves to the right, look on the left for a gate with small brown Park sign. If you reach Lamberton Road you’ve gone too far. Park on the shoulder of the road, near the gate. Don’t block the gate. 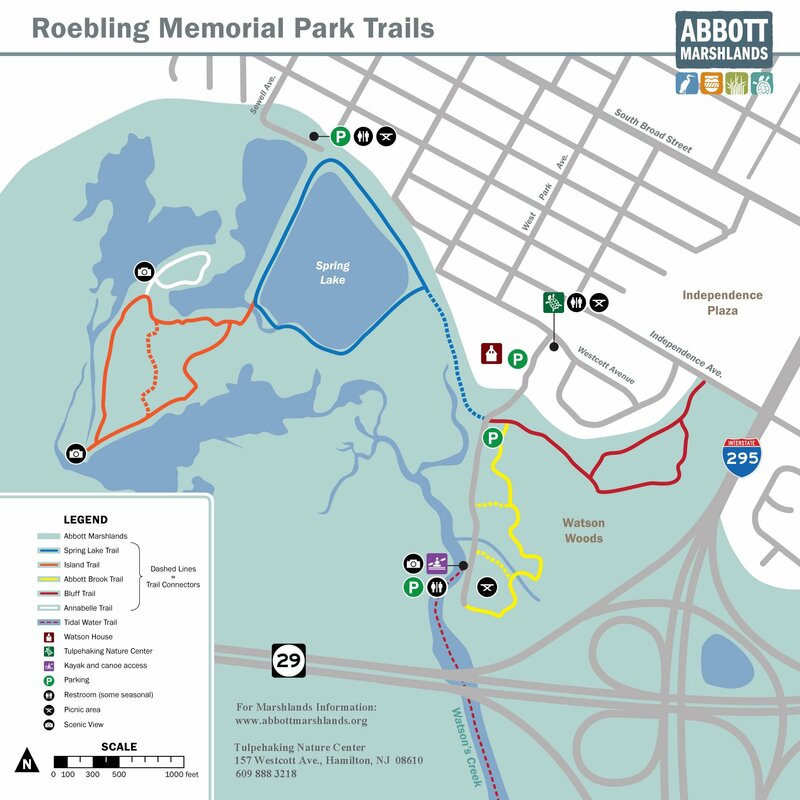 Walk around the gate to the trail; it is It 3.3 miles via the trail to the I-295 Scenic Overlook (7 A and 7 B). From Route 29 South, take the Duck Island/Lamberton Road exit. Turn left at Canal Boulevard. After a short distance look on the right for a gate with a small brown Park sign. From Route 29 North, take the Duck Island/Lamberton Road exit. You will first be on Canal Boulevard. Follow Canal Boulevard past Sturgeon Pond; after the road curves to the right, look on the left for a gate with small brown Park sign. *Note: On some maps Canal Boulevard is called Lamberton Road Connector. From NJ 129 south take the Lamberton Road exit; you will first be on Canal Boulevard. Follow Canal Boulevard to a t-intersection; turn left onto Lamberton Road. Drive more than 1 mile, passing PSE&G and oil tanks. Park in the parking area at the very end of the road. If you are facing the fence (south), toward the right (west) is a short trail out to the Delaware River. From Route 29 South, take the Duck Island/Lamberton Road exit. Follow Lamberton to its end, passing PSE&G and oil tanks along the way. From Route 29 North, take the Duck Island/Lamberton Road exit. You will first be on Canal Boulevard. At a t-intersection, turn left (south) onto Lamberton Road. Follow Lamberton Road to its end, passing PSE&G and oil tanks along the way. *Note: On some maps Canal Boulevard is called Lamberton Road Connector. From NJ 129 south take the Lamberton Road exit; you will first be on Canal Boulevard. At a t-intersection, turn right onto Lamberton Road. The Boat launch is a short distance north on the left. From Route 29 South, take the Duck Island/Lamberton Road exit. Once on Lamberton Road, go past the Trenton Marine Terminal. The launch area will be a short distance further on your right. From route 29 North, take the Duck Island/Lamberton Road exit. You will first be on Canal Boulevard. At a t-intersection, turn right onto Lamberton Road. Once on Lamberton Road, the launch area will be on your left. 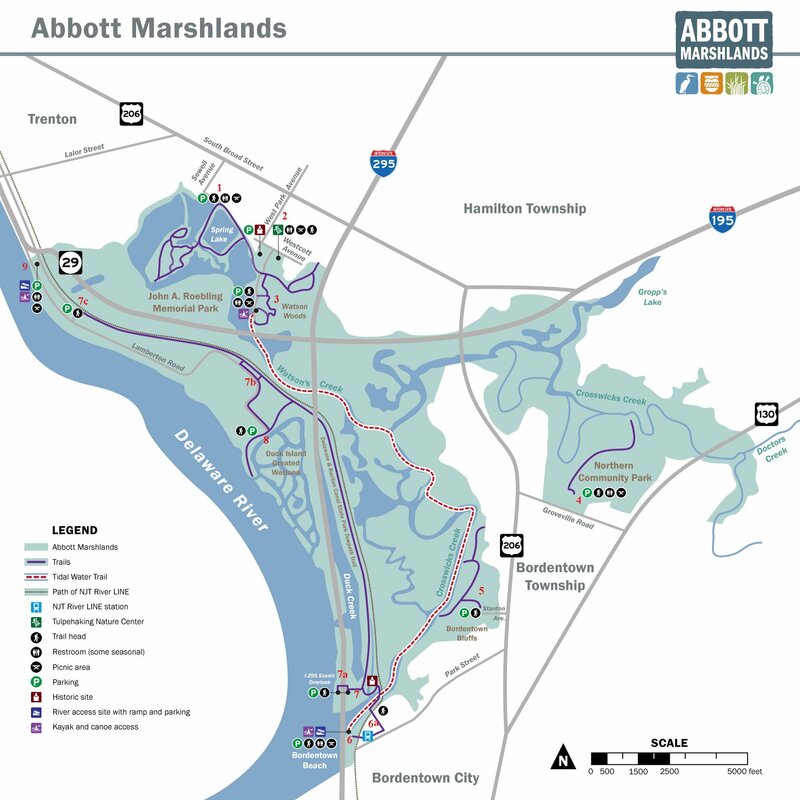 NOTICE: Neither Friends for the Marsh, D&R Greenway Land Trust, or other organizations or individuals mentioned in this website are responsible for injury, loss of property, or other events that might occur on a visit at the Abbott Marshlands. Please walk on trails. The marsh is a fragile resource. Trampled plants may not recover. Please note that trails may be slightly rerouted due to downed trees. Trails have been marked using plastic arrows instead of blazes (paint). When canoeing or kayaking, take care in tidal areas; currents may be fast, forceful, and dangerous, and the water deep. Wear a life vest at all times. Take guided trips if you are an inexperienced paddler. Except for Spring Lake, waterways are tidal. For tide information see local newspapers or Tides on this website. Please follow canoe / boating courtesy rules when you paddle. 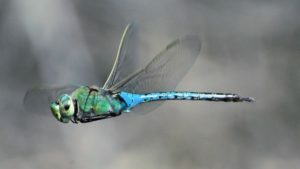 See www.americancanoe.org, then click on Learn To Paddle, then click on Top Five Tips; or http://dnr.wi.gov/org/caer/ce/eek/nature/camp/canoesafety.htm. Large boats that are difficult to turn have the right of way. For information about field trips check the Calendar or see Full List. For a schedule of trips co-sponsored by Friends for the Abbott Marshlands check our Calendar or see the Full List.